The new "Infinity Pen" encapsulates a small piece of the space rock that exploded over Russia in February 2013. You can now imbue even your most mundane scribblings with a bit of otherworldly flair. 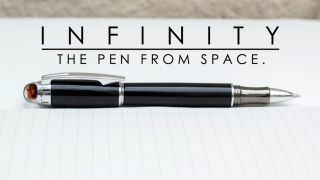 A team of entrepreneurs launched the "Infinity Pen" project — which will include a tiny chunk of the asteroid that exploded over Russia in February 2013 in the titular pen — on the crowdfunding site Kickstarter today (March 29). Backers of the campaign have the chance to buy one of the meteorite pens for $55. "We wanted to design something that puts this amazing piece of the universe in the palm of your hands," Infinity Pen founder James Glass said in a statement. The team sourced the Chelyabinsk rocks from a reputable meteorite broker and has enough material to make 800 pens, Infinity Pen representatives told Space.com. If the pens don't sell out during the Kickstarter campaign, the remainder will retail for $125. Scientists think the asteroid that caused the Chelyabinsk explosion was about 65 feet (20 meters) wide. On Feb. 15, 2013, this space rock slammed into Earth's atmosphere at about 40,000 mph (64,000 km/h), eventually detonating about 18 miles (29 kilometers) above the Russian city of Chelyabinsk. The shock wave generated by the explosion damaged thousands of buildings below, shattering windows whose flying glass shards injured 1,500 people. The Chelyabinsk airburst was the most powerful such event since 1908, when an object thought to be about 130 feet (40 m) wide exploded over Siberia, flattening about 770 square miles (2,000 square km) of forest.